Of course if you ask me, I’m going to suggest resurfacing as a better bathtub option over tub and shower liners. However, there is more that goes into that conclusion than just the fact that I am in the resurfacing industry. 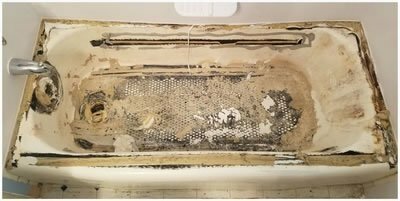 I have over 25 years of home renovation experience in and around the Omaha area and one of the things I have witnessed over the years is the destructive force of water being where it is not suppose to be. As you can see from the video to the left, liners can create a very nasty and unsanitary condition in your home. Resurfacing, when preformed properly with quality products, provides a beautiful and durable finish that will last for years with proper care. Resurfacing is also a much more affordable option to tub liners as well. Check out how Angie’s List compares Resurfacing to Tub Liners. What is a tub liner? A liner for your tub consists of sheets of PVC plastic or acrylic which are molded to the shape of a tub, placed over your existing tub, and then glued down to cover it up. 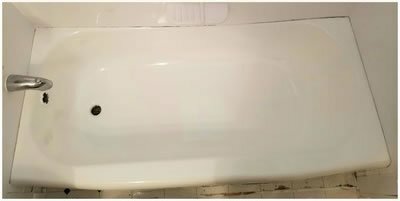 A tub liner is simply an acrylic cover that requires you to trade the deep gloss of a restored porcelain tub for the look and feel of plastic. How do bathtub liners compare to bathtub refinishing? Tub liners are often marketed as a better alternative to resurfacing. However, liners may not be your best option when you consider all of the problems with liners. This is a tub after the removal of a liner. This is the same tub once Renew Resurfacing refinished it! The average acrylic liner installation costs $1300 and if you add a wall system, soap dishes, etc, the cost can go as high as $4000! 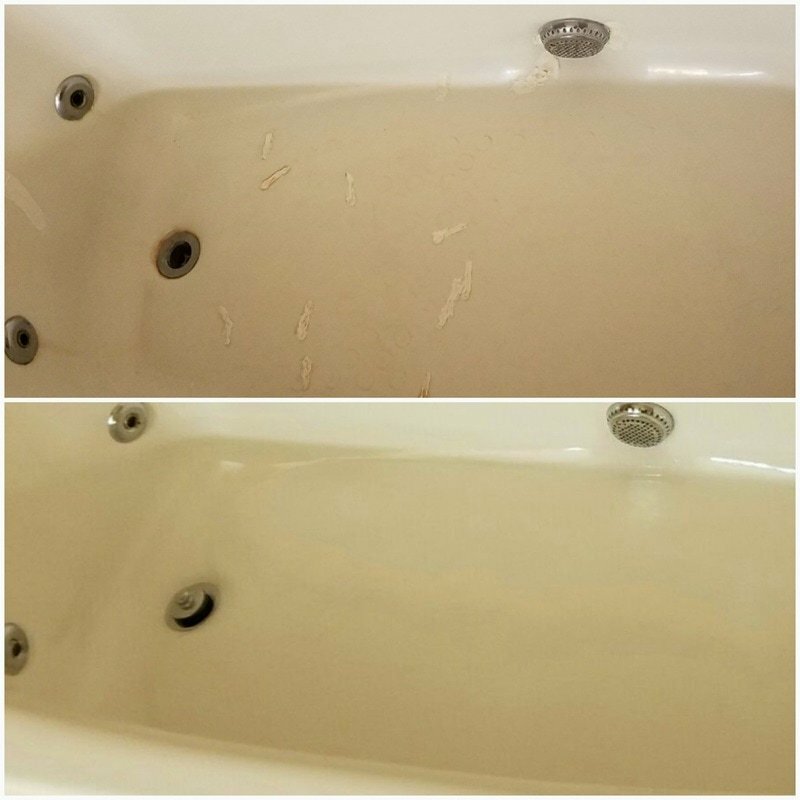 The cost to have Renew Resurfacing refinish your bathtub to like new look and feel ranges from $400 to $600 depending on the location and condition. The cost to refinish both the tub and the tile surround ranges from $800 to $1200. Refinishing is often 30% to 50% cheaper than bathtub liners! Bathtub liners can develop leaks…leading to mold and mildew. Tub liners suffer a bad reputation for allowing water to leak between the old tub and the new liner. Any small crack or hole which develops in the caulking along the seam between the liner and the vertical wall surround can allow water to penetrate and build up between the liner and the old tub. Water can also leak around the drain or overflow joints. If water does leak and get trapped between the liner and the tub, the water is almost impossible to remove. The result can be a “squishy” feeling each time someone steps in and out of the tub. Not only can the misplaced water create a “squishy” feeling, worse yet, the standing water can become stagnant, creating obnoxious odor problems. Stagnant moisture can lead to unhealthy mold and mildew build up. Tub liners take longer than one day. They take several weeks from measuring and ordering to actual installation. Here’s the typical process. 1. A salesman comes to your home to have you sign a contract. 2. If the salesman can’t, an installer then comes to your home to measure your tub. 3. The factory uses the measurements to fabricate a shell. 4. The factory ships the shell to the installer. 5. Another appointment is scheduled to install the shell or liner. 6. The shell is installed, usually in one day, but weeks after you signed the contract. They require a licensed plumber. Bathtub liners can create plumbing problems because the added thickness of the liner often requires an extension of the drain and overflow. Liners for your tub can be difficult to replace. Liners eventually wear out and have to be replaced. Since liners are glued to the old tub when installed, they usually have to be ripped or cut out in order to replace them. Tub liners or inserts can crack. If liners do not match the contours of the existing tub, then the liner may flex back and forth and can crack. ​Bathtub liners come in a limited color selection. Limited colors may limit your decorating plans.